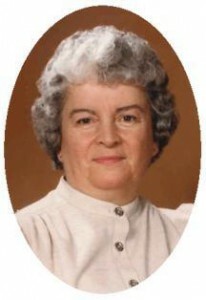 Bernice A. Hansen, 86, died at her daughter’s home in Utah on Saturday, April 13, 2013. She was born July 25, 1926 in Port Washington, Wisconsin to Edward D. and Cecilia Lorge Schanen. She married Leroy G. Hansen of Milwaukee, Wisconsin on January 28, 1950 at St. Mary’s Church in Port Washington. He preceded her in death September 7, 1979. Bernice made her home on Port Washington on N. Benjamin Street for many years before moving to the Maple Crest Apartments. In 2007 she moved to Greenfield and then in 2009 moved to Utah to be near her daughter. She enjoyed reading and knitting, making beautiful afghans for family. She is survived by her children Patrick Hansen of Greenfield, Wisconsin and Pamela Elam of Centerville, Utah. Further survived by daughter-in-law Barb Hansen of Appleton, Wisconsin, 11 grandchildren, 10 great-grandchildren, brother Lyle Schanen of Sheboygan, sisters Lucille Poytinger of Brookfield, Janet (Art) Kabelonsky of Sussex and Arlene (the late Harold) Barian of Waukesha, sister-in-law Flora Schanen of Campbellsport, other relatives and friends. Preceded by her husband Leroy, son Paul Hansen and brother Gerald Schanen. The Rev. Patrick Wendt will celebrate Mass of Christian Burial 11 am Saturday, April 20, 2013 at St. Peter of Alcantara Catholic Church, 1800 N. Wisconsin Street, Port Washington. Interment parish cemetery. Visitation 9 am to 11 am Saturday AT CHURCH. Memorials to Port Catholic School Library (1802 N. Wisconsin Street – Port Washington, WI 53074) appreciated.